A 69-year-old man was admitted for a second opinion concerning swelling of the ankles and hypoalbuminaemia of 1.5 years' duration. He denied having diarrhea, weight loss, night sweats, and fever. Once proteinuria was excluded and liver synthesis function proved normal, a protein-losing enteropathy was suspected. Upper and lower GI series and an abdominal CT scan did not reveal any abnormalities, and duodenal biopsy results showed normal villous architecture. A 72-year-old man underwent capsule endoscopy (CE) because of obscure GI bleeding over a 1-year period. 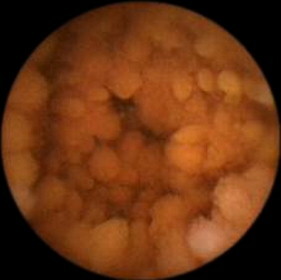 CE showed a small polyp in the mid small intestine (A, left). Bleeding from the lesion was observed after prolonged contact with the capsule (A, right), thereby suggesting that it was the bleeding point. The patient underwent double balloon endoscopy (DBE), which confirmed an irregularly shaped polyp (B) and allowed an endoscopic resection to be performed successfully. Histologic examination revealed proliferation of capillary-sized vessels with a lobular arrangement (C, H&E, orig. mag. ×4). The stroma of the lesion was edematous with an acute and chronic inflammatory cell infiltration (D [magnification of box in C], H&E, orig. mag. ×40). These findings were consistent with pyogenic granuloma. There has been no recurrence of GI bleeding 13 months after the polypectomy. A 52-year-old man was hospitalized because of the discovery of an abdominal mass 2 weeks earlier. On examination, a 5 × 4-cm tender mass was palpable in the right lower abdomen. Barium contrast radiography of the colon and ileum revealed multiple intraluminal filling defects in the terminal ileum without dilation of the more proximal small bowel. CT disclosed marked wall thickening of the terminal ileum with small lymph nodes adjacent to the thickened wall. At colonoscopy, a huge, round mass was compressing the proximal ascending colon (A). The mucosa over the mass looked normal. The terminal ileum was stenotic and there were shallow ulcers, mucosal nodularity, and blood clots present (B). At surgery, a diffusely infiltrative mass was found encircling the ileal wall. The cut surface of the resection specimen had a homogeneous gray color with a “fish-flesh” like appearance (C). Infection with Epstein-Barr virus was confirmed by serology and polymerase chain reaction with virus nuclear antigen-1 primer. Histopathologic evaluation of the specimen disclosed sheets of monotonous round cells with scanty cytoplasm, moderately coarse chromatin, and numerous mitoses with interspersed starry sky macrophages (D; H&E, orig. mag. ×400) Treatment included 6 cycles of adjuvant chemotherapy and there has been no evidence of recurrence on short-term follow-up.